Our restaurant "Mexcalli" invites you to live an unforgettable experience of an authentic mexican flavour that can be tasted in each of our dishes. The mexican cuisine is rich and varied. 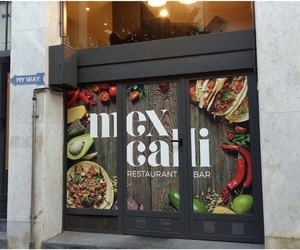 At Mexcalli we are offering a small variety of the mexican cuisine. We hope that you enjoy it. The restaurant is nicely arranged and it is the perfect place to enjoy a dish in a simple but familiar atmosphere. Unlike other restaurants, we don't offer american TexMex. We only offer typical mexican dishes prepared according to traditional recipes from our lands. The products we need to prepare our dishes are always fresh and bought exclusively at local markets. Our principal aim is to serve you high quality dishes. We are wating for all lovers of the mexican kitchen and are willing to offer you traditional and abundand dishes with fresh ingredients. It will be a pleasure for us to serve you.